Ever since he stepped down/backwards from Microsoft Bill Gates has kept me constantly inspired with his unique and new ways of looking at the most ordinary of every day problems and applying or reaching out for solutions to be found. 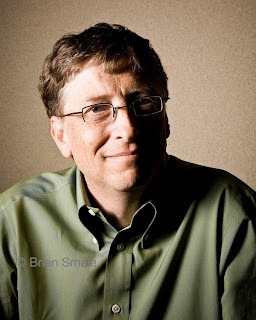 Thus far I’ve been following the ‘Bill and Melinda Gates Foundation’ from a far via their website, but I think I really need to take a page out of BillG’s book and really start to expand my research and interesting to find out a lot more. A while ago I watched a TED talk from Gates on the subject of finding a way to produce cheap and affordable renewable energy for the poor; the premise being that if vast amounts of energy/fuel can be produced for a mediocre price, then the gap between the rich and the poor decreases in terms of living standards and what can be achieved, whilst also reducing the environmental risks and factors. Truly inspiring stuff, yet absolutely straight forward thinking to what could be a very difficult problem to manage in the future if we as a collective don’t achieve it. On a slightly separate note, this past week I’ve read four separate articles on solar power and how the technology seems to be improving at a vast rate of clicks and as a result some people have some truly ‘big thinking’ projects on the cards. I even looked into the cost of my own solar panels in order to do my own bit and while the cost of panels far outweigh my own budget right now, I hope one day the price does alter and come down to allow more people to invest in these panels. I do believe that by working in IT, you have a bit more of awareness in energy consumption and providing savings where possible. Data Centres are always a constant space for review in terms of how many servers that are crammed into these rooms, balanced off against heat and cooling with air conditioning units running 24/7 and providing backup power alternatives for all of these things. People responsible for these things tend to be pretty good at designing these types of rooms and coming up with solutions to keep the balance just right whilst at the exact same time keeping the amount of energy usage low and the cost of implementation down (or that’s certainly the case where I’ve ever worked). But I’m getting slightly off track; last week Bill Gates closed the “Techonomy Conference” with a few more insights, thoughts and sources for inspiration to the world. The two that stood out (or at least the two things that were reported on TechCrunch), were education and latrines (obviously). Now I don’t know too much about latrines and I’m not even going to start to speculate where or why one might want to start researching more – but the education thing kind of struck a chord with me. BillG reckons that in 5 years the best education will come from the Internet as the best lectures in the world will be hosted here, the stand-out problem is finding a way to recognise those who choose to learn from the web. It’s a good point. As someone who never took the University education route ever since leaving college and going straight into work, a lot of my ‘missing education’ has been sourced from the web or from reading books and learning for myself. The problem for me is that these things cannot be officially recognised on my CV as I’ve never actually gained a qualification or attended a training course as such. A quick browse through my book shelf you’d be amazed by how many business books there are – yet, up until last year I never had any sort of qualification in business studies (over a year and a bit ago I did an ‘Introduction to Business Studies’ with the Open University, a course which bored the living daylights out of me for two reasons, the structure of the course was far too restrictive and basic in comparison to some of the books I read – yet get no credit for). Also on my book shelf are a number of books for social networking and the Internet; as you’d expect I know and understand the impact that companies such as Twitter, Facebook, Amazon, Google, etc all have on the modern world and how they interact with each other to create these digital eco-systems of the future now. Yet, my ex glided through a University Masters degree designed on the back of Social Media in Business (some of her course I actually broke down, understood and wrote for her – foolishly). Again, its something I know a lot about yet have no official credit or official recognition for when it comes to certification and applying for new jobs, proving my worth, etc. The Open University in the UK is obviously a vastly important institution for providing part of this online Internet education – yet it’s not what Bill Gates is talking about in his vision of an ‘Internet education’. The OU courses are available at a price and some of the courses are quite highly priced too, especially when most of the content can be downloaded or found on the Internet for free (YouTube is always a good source of free information, as long as you’re not too distracted by the other videos on the site). It’s a tricky challenge to tackle for sure, whilst some sort of ‘Education Passport’ possibly not too dissimilar from Facebook or Digg’s “Like” or “Digg” button respectively is placed on the bottom of articles and videos goes some way of keeping track of those things you’ve watched/read and learnt about, this poses two issues; remembering to press the button before you click a link to the next site and secondly, actually verifying that the user has actually watched/read and learnt something. The other problems include getting everyone to use such a service and having the educational institutions that participate and make the lectures free to the online community sign up to this single online educational online tracking program. It’d be nice if Microsoft were able to develop its own ‘educational arm’ to the company, to run and operate such a web service and bring together these training/educational materials and manage user’s ‘education passports’. After all Microsoft was the company that brought us ‘Encarta’ that certainly provided a good source of educational material when I was a kid. If it’s not Microsoft that does this, then this is the ideal project for some web start up to solve and develop such a platform; after all this is a far more attractive proposition than designing the next latrine….unless that’s really your thing.